I can’t believe how fast time passes. Exactly three years ago, I was writing my first article on this blog. Everything started as a decision of sharing knowledge but ended up being much more. Every week, I receive comments and emails from readers with lots of different questions. I try to be as helpful as I can, but sometimes the matters are way too complex to answer with a simple email or article. I’ve experimented with new formats, like my newsletter or my toolkit, and ultimately decided to launch a questionnaire to create an online course. The questionnaire had an incredible response. More than 700 people wrote extensive and detailed answers sharing the challenges they were facing as illustrators. It took me a long time to process all the answers, and while I was going through that process, I started to realize that perhaps the online course I wanted to create would only address a fraction of the issues. If I wanted to be truly helpful, I had to face the challenge from a different perspective. Many people pointed out in the questionnaire that sometimes it’s difficult to find information about how to work as a professional illustrator. But also to connect with other illustrators, find resources, and grow. And I agree. When I started, I had a hard time figuring out how the profession worked aside from creating artwork. I always found that other similar professions like graphic design are way more developed in those terms, having industries, media and way more resources around them. Perhaps I could create a project to address those issues and make that information more accessible? A more abstract and flexible entity than an online course. A project like that would definitely have the potential to be very helpful and solve many of those challenges. On the other hand, the online course I intended to create already required a set of tools and functionalities around it: a community space, resources, and additional support for the students. At that point, my focus shifted from creating a course to creating a platform for illustrators. And that’s how illustration.tools was born. During the last 15 months, I’ve been secretly working on illustration.tools. A few months ago, Hanu joined me to polish the design, as he did when we redesigned the blog. The process has been slow. I’ve had to learn a lot of new things, experiment and invest hundreds of hours, while I was working on creating illustrations and animations. But today, I’m extremely excited to introduce you to the first public version of illustration.tools. 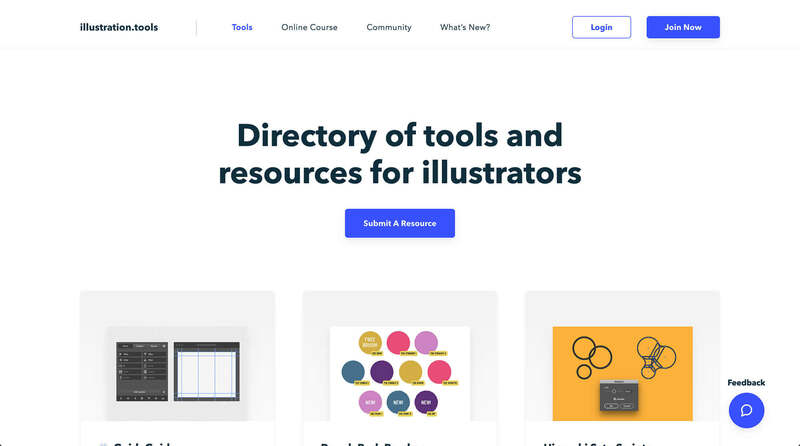 It features a directory of tools and resources for illustrators, a private community, and hosts the online course. This is just the beginning, the foundations of the project. 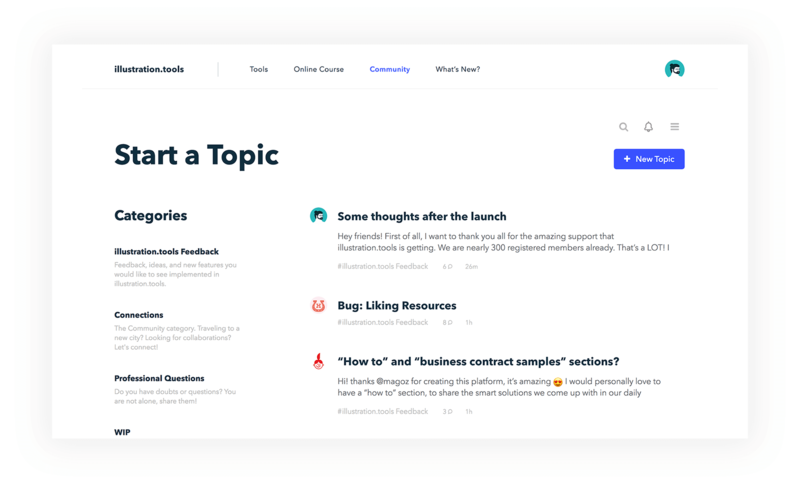 My goal is to develop more tools, add new features, and talk to the community to keep shaping and improving the platform. Ultimately, I want to make the platform for illustrators that I always wished existed. Now that illustration.tools is finally public, I no longer want to keep working secretly and waiting months until I release updates. I want to move fast and openly. I want to fight perfectionism. I’ve already taught this course several times offline in the last few months. The feedback has been great, so the course structure and contents are working. I’m now in the process of adapting the course to the online format. I’m writing down the contents, creating scripts, doing some recording tests, and figuring out the best way to deliver the content. I have to produce more than 25 lessons. So, I expect it will take me a few months. 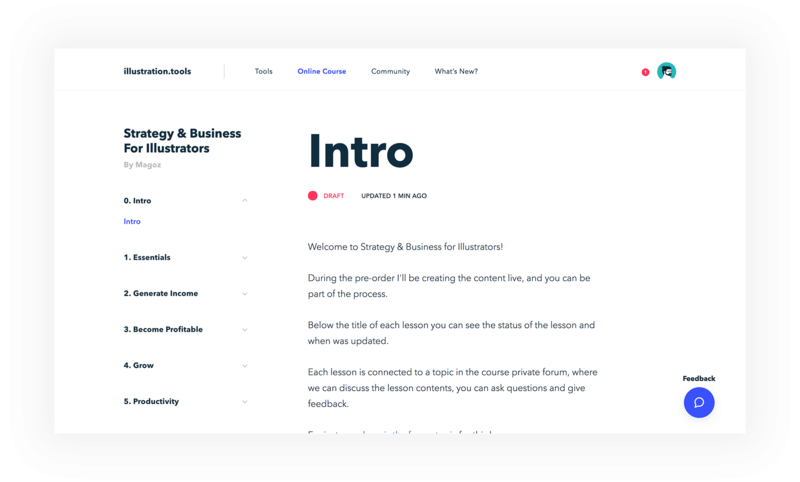 If you pre-order the online course, you will get immediate access to the lessons and access the process of building the online course. I’ll be uploading new lessons every week and looking forward to the feedback to produce the best online course I can. When I complete all the lessons, the course will officially launch. As a reward, the pre-order is 33% off the release price, and it will give you full and lifetime access to the course. Strategy & Business for Illustrators covers everything I’ve learned since I started, from a business and strategic perspective. Today is my birthday, and I’m super excited to celebrate it launching illustration.tools after so many months working secretly. So, I decided to give away free invites for a few days! Here you can create an account for free. The link will work until May 10th, 10pm Central European Time (CET). An illustration.tools lifetime membership allows you to access the private community (the online course is not included). In the future, it will unlock more tools and goodies. I can’t believe this day has finally arrived! You can contribute by submitting tools and resources, becoming a member of illustration.tools, providing feedback and being part of the community. Thanks to all of you that answered the questionnaire and were waiting so long for the online course! And, if you use some that are not listed, please submit them! Thanks, Isabel! Let’s build a strong community and do it together! Over the years I got so great input and motivation and inspiration I wanna say thank you for sharing and thank you for your helpful blog and giving all of us the chance to get better and look into an illustrator workflow, happy birthday, keep the magic ! Thank you, Patricia! It means a lot! Happy birthday! I am excited with this project, thank you very much! I love the idea, so, yes! come on to build a strong community! I love your blog and find interesting the idea of illustration.tools, cause what I see now in illustration community here in Poland: lots of professionals do not want to share their tips, experience etc. And on your blog or in the community, that you are trying to build — it is appreciated to share with others in order to make more professional and beautiful industry. ¡Muchas felicidades y que crees mucho más!. Me parece una idea excelente todo esto que tienes entre manos. Te deseo mucha suerte en este nuevo proyecto. Sigo leyéndote. Un superabrazo! Wow! This is really awesome man. Thank you for Bunch of tools.! Awesome I loved it! Thanks, Hugo! Happy to have you onboard! Uueeee, congrats! Im also excited cause I feel the illustration industry really needs this. I wish you great success! Big hug! Thank you for sharing your insight as always and always striving to work better! Your speadsheet templates and app recommendations have been really useful, been using them for over a year and they’ve really changed my workflow! Wow! Thanks, Ellen. That really means a lot to me. Happy Birthday Magoz! And congratulations for Illustration.tools. I am sure it will be very helpful for all of us. I love it already and will meet you there ;). I’m very excited about illustration.tools! Thanks, man! This is so useful! Thank you for all your dedication and good vibes.